Olivia Agbanlahor and her six year old twins Great and Melissa are a Nigerian family facing deportation on this Thursday 19 July unless Minister Brian Lenihan intervenes to allow them to remain in Ireland. In March 2003 the young mother and her children moved to Ireland and were allocated accommodation in a reception centre for asylum seekers in Clonakility, Co Cork. Over time they integrated themselves into the local community, gaining the support and esteem of their neighbours. Great went to kindergarten there for a year, then to primary school where he got the support of a special needs assistant. Outgoing Justice Minister Michael McDowell signed an order to deport the family last year but at the time Great had not been diagnosed with autism. Initially he had been diagnosed with ADHD but in December last year it was discovered that he is Autistic – a condition that makes normal social interaction very difficult. Michael McDowell’s decision was challenged in the High Court, but a judge ruled earlier this year that McDowell was correct not to revoke the deportation order against the family. After four years fighting her case Olivia recently abandoned a second legal challenge against their deportation because, as she said, she was utterly exhausted from a four year fight to remain in this country – a country where she says she “experienced more love and support” from the community than in any other place in her life. Clonakilty Lodge, where the Agbanlahors lived when they moved to Ireland, closed as a reception centre last year. The family was then moved to Killarney where again they gained the support of the local community in their campaign to be allowed to stay in Ireland. Despite this and despite representations made on their behalf by local political representatives like Sinn Féin councillor Cionnaith Ó Suilleabháin and Martin Ferris TD, the family still face deportation. Autism is a condition that requires ongoing and intensive care. It is also understood that people with any form of physical or mental disability are ostracised in Nigerian society as disability is perceived to be associated with possession by evil spirits. So not only will Great not receive the appropriate support for Autism but he and his family will be ostracised. Representative for Families Against Racism Rosanna Flynn said it was one the saddest cases she had come across, expressing the hope that Minister Lenihan would revoke the deportation order. Olive O’Sullivan, of the Great Justice Action Campaign, said the family has integrated well into the community in Kinsale, Co Cork, and many of their friends would be fearful for the family’s safety in Nigeria. Her solicitor has written to Minister Brian Lenihan asking for a revocation of the deportation order placed by former minister Michael McDowell. Olivia’s future and that of her two children is now in the hands of Minister Lenihan. It would be very tragic if a former Minister of State for Health and Children should abandon this family to what would undoubtedly be a very poor fate. “The twins have never been to Africa – they have spent more time in Ireland than in Italy the country where they were born. They are living in Limbo. I’ve no remaining family in Nigeria, my parents are dead and I’m an only child. It would be a sentence to death if Great went back to Nigeria where there is no treatment for Autism. Here he is responding very well to treatment and to special needs tuition. 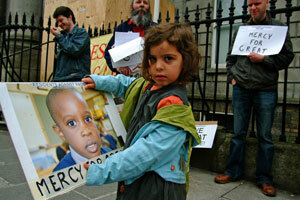 How will he survive if he’s sent back to Nigeria – no school, no support and no hope? I’d prefer to die here than go back. If I go back we face a life of destitution,” Ms Agbonlahor said. Speaking to An Phoblacht this week Councillor Cionaith Ó Súilleabháin of Cork Sinn Féin said it would be “a travesty of justice if Olivia and the twins were sent back to Nigeria a country where the children have never been. In particular Great’s condition warrants a more humanitarian approach than has been shown. The support group Great Justice Action Campaign had hung hopes on Minister Brian Lenihan’s former ministry for Health and Children in the last government, believing he would be aware of and sympathetic to issues surrounding the welfare of children. It would be a terrible act of inhumanity if this family is deported”, he said. Councillor Ó Suilleabháin is in ongoing contact with political representatives and spokespersons across the political spectrum in an effort to highlight the plight of the Agbanlahors.